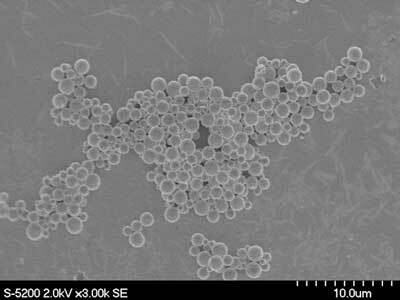 (Nanowerk News) Researcher David Rosenberg examines images of a white powder under a powerful scanning electron microscope. Up close, the powder looks like coarse gravel, a heap of similar but irregular chunks. Then he looks at a second image — the same material produced by colleague Hongyou Fan instead of purchased from a catalog — and he sees perfectly smooth, uniform spheres. The uniform powder and others like it produced at Sandia National Laboratories don’t just look nice, they outperform commercial varieties used as catalysts in solar cells and which could be used to produce clean-burning hydrogen fuel. If developed for industry, the new technology — subject of a recent paper in Nano Letters ("Self-Assembled One-Dimensional Porphyrin Nanostructures with Enhanced Photocatalytic Hydrogen Generation") — could improve performance while reducing costs of catalysts used everywhere from environmental cleanup to cancer treatment. In fact, it’s a commercial-grade version not unlike household dish soap, minus the dyes and perfumes. Hongyou, the inventor of the detergent-based technology, and his team at the shared Advanced Materials Laboratory at the University of New Mexico use the active ingredient in cleaning solutions to trap raw materials just like grease, encapsulating them inside cages made up of detergent molecules. The cage acts as a molecular mold that dictates the size and shape — or morphology — of the material that forms inside. Remove the detergent, and you’re left with clean, uniform particles. That can be a problem for the engineers who use those materials. Some catalysts don’t work unless they’re arranged in specific ways at the molecular level, and some light-absorbing particles used in solar cells soak up more sunlight at certain sizes than others. When individual particles are irregular, only a fraction of the bulk material performs the way it’s meant to. The rest is dead weight, which also makes it tough to predict the catalyst’s performance. Because Hongyou’s particles are uniform and tightly controlled, engineers could use less material and get the same effect as conventional powders. In one study (Nano Letters, "Morphology-Controlled Self-Assembly and Synthesis of Photocatalytic Nanocrystals"), Hongyou’s version of a photocatalyst, which could be used to clean wastewater, broke down five times more pollutant than its commercial counterpart. In his latest paper, he demonstrated similar improvements in a material that catalytically produces hydrogen. David is scaling up and applying the technology to his explosives research for national security, where unpredictable materials are unacceptable. Alongside a team that’s improving the inputs to computer models, “we saw an incredible, powerful application as it feeds into our modeling efforts,” he says. Sandia develops computer simulations so that David and his team don’t have to physically build and test parts every time. But assumptions that get put into those models can compromise the output. To save computing resources and time, a simulation may assume particles have simpler shapes or are more consistent than they really are. But, it will never perfectly predict how the real material acts. Hongyou’s uniform powders align the material with the model, providing David the ability to control the particles’ structure so that many of the mathematical assumptions go away. Hongyou also is optimizing materials for potential applications like energy conversion in solar cells, phototherapy for cancer treatment and hydrogen production for clean fuel sources by creating well-known particles in brand new shapes. One detergent may result in spheres, but Hongyou can swap it out for a detergent that produces discs, rods or octahedrons. In the study that measured photocatalytic performance, he tested eight shapes against the commercial counterpart before crowning the most effective form. But so far, Hongyou has largely discovered these shapes through trial and error. So he’s enlisted the aid of Younan Xia, a professor at the Georgia Institute of Technology and a pioneer in nanomaterial synthesis, to accelerate his work. We are measuring fundamental kinetics, how fast atoms or molecules are deposited on the surface of growing nanoparticles,” Younan says. “The final structure of particles depends on that rate relative to the surface diffusion rate,” or the rate at which molecules drift away. Younan and Hongyou are working together to develop a recipe to replicate certain shapes based on the detergent, temperature, pH value and concentration. Like turning knobs, they could adjust these inputs to get a reliable output. Georgia Tech is a member of Sandia’s academic alliance. The alliance aims to solve the nation’s significant technical problems, develop the next-generation of scientists and engineers and accelerate the adoption of new technologies.